It has been called life's first food, a thick, yellow substance that is produced toward the end of a female's pregnancy and is emitted by her mammary glands during the first 72 hours after giving birth. While humans produce small amounts of colostrum, a cow produces approximately nine gallons during the first thirty-six hours after giving birth. Each drop contains the promise of life: immunoglobulins, growth factors, antibodies, vitamins, minerals, enzymes, amino acids, and other special substances designed to "prime" the body to face a lifetime of invasion by various microorganisms and environmental toxins bent on destruction. Colostrum is "Nature's Healing Miracle", according to prominent physician Donald Henderson, M.D. Medical research shows that colostrum is possibly the one supplement that can help everyone who suffers from a chronic illness. And, it's the most important preventative supplement you’ll ever find. As we age, we notice it takes us a little longer to fight off a cold or flu, something aches, our energy and enthusiasm have lessened, our skin loses its elasticity and gravity takes its toll on our bodies. Our focus may turn to health and anti aging products. We may try to balance our own vitamins, minerals and herbs.. many times unaware of dangerous doses and combinations. We’ve looked everywhere for an answer. We’ve asked plants and minerals for something they’re unable to provide because they don’t have immune systems to produce immune factors and immunoglobulins and they don’t have growth factors for muscle, skin and bone. With killer bugs at our doorstep, we need to look to what was designed specifically for the survival of our species. Aging, illness and death occur with the loss of immune and growth factors in our bodies. Medical science has shown in hundreds of published reports worldwide that these can possibly be replaced in the human body....with bovine colostrum. Research has shown that once we pass puberty, our bodies gradually produce less of the immune and growth factors that help our bodies fight off disease and heal damaged body tissue. With the loss of these vital components, we age and die. In addition, the body is in constant battle with the toxins of society today. Due to the air we breathe, the food we eat, and the environment that we live in, vital nutrients are always being lost and colostrum is the only natural source of these life-giving components (immune factors and growth factors). Unlike other supplements that isolate and sometimes overdose the body in unbalanced ways, colostrum is always a perfect combination. Research has shown that colostrum has the demonstrated ability to kill bacteria and viral invaders, stimulate tissue repair (particularly the bowel lining), stimulate fat utilization for fuel and optimize cellular reproduction (anti-aging). No other substance on the planet can provide all of these marvelous benefits. Learn what prescribing physicians and health practitioners have to say about how colostrum is benefitting their patients. Healing success stories from real people using colostrum for a variety of chronic conditions. Get answers to frequently asked questions about colostrum, watch informative videos and peruse the Vital Health News archives. If your colostrum is heat-dried, not end product tested for bioactivity and does not have the LD (Liposomal Delivery) reapplied to the dried colostrum, it is no more effective than powdered milk. 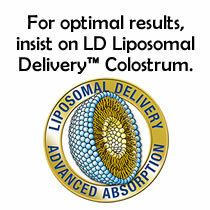 Liposomal Delivery makes colostrum (and other nutrients) up to 1,500 % more bioavailable. -- Robert R. Milne M.D. If you’re not receiving a benefit, you are either not taking enough or you are choosing a brand that is not processed correctly.